It's spring, and as a business owner, you may be thinking about buying a boat for getting out on the river, lake, or stream. Or maybe you are thinking of buying an airplane and renting it out through a general aviation facility. And, hey, perhaps we can use the boat or airplane or business purposes and write it off. Before you buy that airplane or boat, think carefully about how you want to use it for business purposes. If you're going to use the boat or airplane for entertaining customers, vendors, or business associates, you need to know about whether expenses associated with it are deductible. The same tax regulations apply to motor homes, and other similar vehicles and facilities. An entertainment facility is any property you own, rent, or use for entertainment. Examples include a yacht, hunting lodge, fishing camp, swimming pool, tennis court, bowling alley, car, airplane, apartment, hotel suite, or home in a vacation resort. The IRS does allow a business to deduct expenses for entertaining on your boats, such as food and beverages, catering, gas, and fishing bait. But you can't deduct the direct expenses of using the boat for entertainment. Generally, the IRS says you cannot deduct any expense for the use of an entertainment facility, including a boat or airplane. This includes expenses for depreciation and operating costs such as rent, utilities, maintenance, and protection. 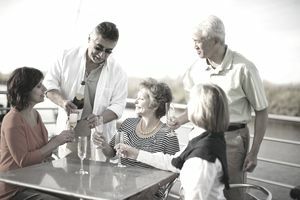 You can deduct out-of-pocket expenses, such as for food and beverages, catering, gas, and fishing bait, that you provided during entertainment at a facility, like a boat. These are not expenses for the use of an entertainment facility. As with other entertainment expenses, however, you must be able to document that these expenses are directly related to or associated with your business. And all entertainment expenses are subject to the 50% limit; that is, only up to 50% of allowable expenses may be deducted. If you are entertaining employees, you must be able to show that the entertainment on your boat has a business purpose. For example, a "team building" exercise on a boat may or may not pass the IRS's scrutiny, and the employees may have to pay taxes on the expenses. If the boat or airplane is used as a business (for hire, for example), you can get some tax benefits from this business. Depreciation. You can depreciate the boat or airplane as a business asset, over its useful life, if it qualifies as a business asset (see below). Expenses. You can deduct expenses for operating the boat or airplane for business purposes. Gasoline, maintenance, mooring fees, insurance, and repairs can be included in the deductible expenses. Sounds like a good deal? Maybe. Document business use. You must be able to provide documentation about the use of the boat for business purposes. The documents must be (1) contemporaneous: at the time of the event, and (2) include specifics: when was it used? Who was it used for (include names and titles)? What was the specific business purpose? Depreciating the boat or airplane IRS has designated a particular category of business assets called listed property, which includes computers, autos, boats, and other assets that can have both business and personal uses. So, if you use your boat or airplane for charter business purposes, and you also take it out for personal reasons, you must document what percentage of the time you use it for business. To be eligible for depreciated, a listed property must be used predominantly (more than 50%) for business purpose. Personal use becomes income. Once you have established the boat or airplane as a business asset, any personal use becomes a benefit to you personally, and, yes, you must pay taxes on this personal use. Boat or airplane as a business vs. a hobby. If you buy a boat or airplane for business use, you must be able to show that you are running a legitimate business, and are not just taking out fishing or flight charters as a hobby. To avoid IRS scrutiny under "hobby loss" rules, you must keep good business records, show that you intend to make a profit, and make a profit. Don't Want to Keep Detailed Records of Business Use? Your other option is to buy the boat or airplane personally, giving up the depreciation and expense deductions. This saves a lot of time with your tax advisor, too. Just enjoy the boat, occasionally using it for business. You might explore other ownership options, such as co-ownership or setting up the ownership as a partnership. Even if you set up a business to own the boat or airplane, the same tax restrictions apply.